As a parent, one of the worst things you have to go through is seeing your child in pain or upset as a result of having an accident. The worst I’ve had to deal with was Katie cracking her head open on the concrete door step at home. This result of this was a hole in her forhead the size of a golfball. This was glued back together and she now has a brave battle scar to show for it. Fortunately she’s been ok psychologically and has no problems seeing other doorsteps or navigating her own. Just to reassure you that there’s normally someone out there worse off than you here’s a list of my accidents and general mishaps over the years. Aged 18 months: Tooth Through Lip Whilst playing with wooden blocks at the top of the stairs I somehow tripped on one and fell down to the bottom pushing my tooth through my bottom lip. I’m hoping that the lack of a stair gate was the result of them not being available rather than a lackadasical approach to parenting from my mum. The result was lots of blood and a permanant scar that resembles the saddle on an earthworm. I only know that as some particularly mean people called me earthworm boy and saddle boy in my first year in secondary school. I hated those teachers. It was made worse as I have big lips anyway and I’d already suffered years of insults because of them. Rubberlips, Paul ‘Bottom Lip’ Albert and fish lips were the ones that immediately spring to mind. My bottom lip in particular would have made a great stunt double lip for Bubba in Forrest Gump. Aged 5: Hernia operation. Officially I’ve always been told I was born with a torn hernia but I have got photos of me weightlifting in my cot so I’m not so convinced. Aged 6: Tonsils out. In itself just a routine op but somehow the doctors knocked my two front teeth out as they were reaching for them. Rumours that the surgeon caught his hand in my bottom lip causing the accident are unfounded. I didn’t care as I had ice cream for a week afterwards. I pretended to be upset about it just to get extra sympathy ice cream. Aged 10: Exploding Face / Splitting Head Open. This must be some kind of record as the two accidents happened less than 24 hours apart. Whilst on a holiday camp we were at the beach and playing baseball using stones and an empty bottle of squash. All was going well until one of the stones bounced off the bottle and onto my face, 3mm from the bottom of my left eye. Cue loads of blood, my mum screaming as she hates the sight of it and my first trip in an ambulance to hospital. The next day was Sports Day and I was gutted that I could only take part in one event (in case my stiches split open). Officially it was Ten Pin Bowling but really it was just glorified skittles on the grass. I managed to get all 10 down with one go and was told to come back in the afternoon to see if anyone else had managed it. When I returned I was informed that I’d won the event. I was excited, I was overjoyed, I jumped up just as a window was opened next to me and my head met the corner of the window frame. More blood, more crying from my poor mum and another trip in the ambulance. Unfortunately it broke down on the way but this meant I saw the inside of three ambulances in 24 hours, surely some kind of record. The nurses couldn’t understand why I was back so soon as my stitches needed to be in for a week. Oh how we all laughed about it. Well they did, I just counted the running total of my growing stiches collection. Aged 11: Cutting Leg In Half (almost). Whilst playing kiss chase at school, (like tag / it but running in pairs holding hands) I tried to escape by running through the old air raid shelter that held all the sports equipment. Somehow I slipped going in and one of my legs had an arguement with a hurdle that had been carelessly left out. The result was a HUGE hole in my leg down to the bone. As I fell back into the playground there was the usual blood but also children crying, screaming and one girl being sick everywhere. Within ten minutes the word on the street (well, around the school) was that my leg fell off and they were trying to sew it back on!) Cue ambulance, hospital, lots of stitches and my poor mum fainting at the sight of my leg. I’ve no idea why but I was so proud of my stitches I framed them when they were taken out and displayed them in my various bedrooms over the years until I got married. Aged 11: Head resembling the Elephant Man. Whilst on holiday in France I came running down the first morning for breakfast. Unfortunately I didn’t notice the completely transparent plate glass double door and ran straight into it, bounced straight off it and within 23 seconds had a cartoon bump on my head the size of Denmark. This was shortly big enough to be mistaken for my secret conjoined twin. Aged 15: Big Time Back Surgery. I was very sporty as a child and did lots of running. After having periods where I’d collapse in agony and then be fine two minutes later I was diagnosed with a small hole in my spine and later a displaced disc which needed seeing to urgently. This was the big time, two weeks in hospital, enough stitches to make a patchwork quilt and an extended period of rest afterwards. No school for over three months! What made it exciting was that three days after the op it was the hospital Spring fair and the guest of honour was……wait for it…..Shakin’ Stevens. This was a big deal for me, after Adam Ant he was my fave singer at the time. Admittingly a few years past the career high of This Old House, Green Door and Oh Julie but still a big deal. I told everyone I was a huge fan and asked if I could meet him. The word went round and I soon found out he was going to come and say hello to me. The day of the fair I sat and waited with my autograph book and camera. I waited a bit more……a bit more……he didn’t come. 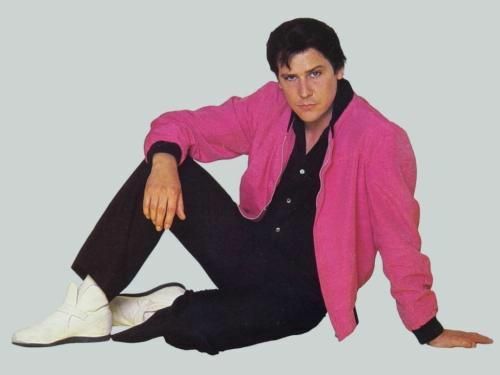 To this day one of my top ten disappointments is the Shakin’ Stevens no show. If you read this Mr Stevens, it’s never too late. I had to spend two months downstairs doing nothing. The upside was that I discovered cricket watching all of England’s test matches against Australia and the like. So I’d forgotten how many accidents / incidents I’d actually had. Rather than you having to read this blog for another 4 hours to discover the rest of the disasters I’ll save it for next time. Enjoy your day and let’s be careful out there people.